This unit connects to the RGB port of the Amiga and provides it with both a scandoubler and a flickerfixer. 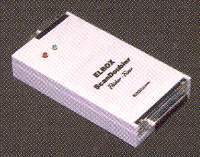 The scandoubler allows you to connect PC SVGA monitors by doubling the Amigas standard 15.5Khz to the 31Khz required by VGA. The flicker fixer part allows you to display interlaced screenmodes without flicker.